As a sidenote before I get into the actual review, I just want to say that if you were ever wondering how amazing and glamorous it might be to blog about pop culture on the internet, I am sitting in my kitchen right now, eating potato salad out of a tupperware and baking bread in the middle of the night because there’s too much caffeine in my blood for me to sleep. So, you know, don’t do drugs, kids. Anyway, we’re officially into Oscar season now, and while I have already viewed a couple of the nominated films, now is the crunch time when I get through as many as I humanly can, exposing myself to drama, pathos, and so many meaningful glances between straining actors that I feel pained. That having been said, let’s start off with Silver Linings Playbook, a romantic dramedy about two dysfunctional, mentally ill people falling in love over competitive ballroom dance. Also football and prescription mood stabilizers. To begin with, and partially as a disclaimer, this movie kind of hit me personally because like Bradley Cooper’s character, I’m bipolar, and I can really relate to the issues he has in the film trying to self-regulate his moods. It’s hard. On the other hand, I never went crazy and tried to beat someone to death for sleeping with my wife, so I can’t say I related entirely. I mostly just have trouble sleeping sometimes. The basic plot of the movie is as follows: Pat, a former history teacher, has just been released from a mental hospital where he was incarcerated for the reasons stated above. He’s back in his life, and desperate to reconnect with his wife, Nicki. At the same time that Pat is trying to fit back into his life, he runs into Tiffany, a young widow coming to grips with her situation and trying to cope with ballroom dancing. They become friends, eventually and begrudgingly, and it’s really no spoiler to say that they fall in love. How it happens is the real story, and that’s where the actual genius of this film comes through. A lot of the movie focuses on magical thinking, the way that people interpret signs and events in their lives to have meaning. Pat’s family, headed by the absolutely amazing Robert De Niro (finally getting out of his Meet the Parents hole), is obsessed with magical thinking. 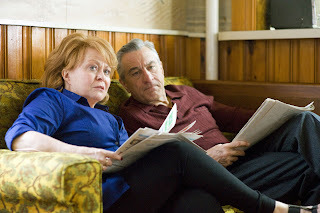 Pat Senior (De Niro) is a compulsive gambler suffering from undiagnosed OCD. He’s convinced that Pat’s luck will help the Eagles win games, on which he bets increasingly exorbitant amounts of money. Pat himself believes that if he can just talk to his wife, Nicki, then he can make her realize how much better he is now and how they should obviously be together. Unfortunately, she has a restraining order out on him, so he can’t even send her a letter. To that end he involves Tiffany, an old acquaintance to act as a go between. Tiffany, also a magical thinker, declares that she’ll only help Pat if he helps her with her ballroom dancing competition, and so the plot progresses. Now, I don’t want to give the film away, so I won’t. Really, go watch the movie. It’s great and even leaves you feeling pretty great about life. The movie is nominated for Best Picture (probably won’t win), Best Director (not overly likely), Best Actor (no way in hell, but it’s nice to see Bradley Cooper getting nominated), and Best Actress (Jennifer Lawrence is spectacular as Tiffany), among others. Of all of these, I think that Lawrence’s chances at Best Actress are the pretty good, though she isn’t likely to win because the Academy can tell she’s got years more of good movies ahead of her and it “isn’t her time yet”. So that stinks, but whatever. It’s still a good movie. The reason I feel like she could have a chance, though, is because Tiffany is a freaking awesome character, and Lawrence is really, truly great at playing her. Tiffany (formerly of Tiffany and Tommy, but Tommy’s dead now) is a clearly screwed up woman trying desperately to figure herself out and making a lot of mistakes. I know that sounds like a description of every character ever, but hear me out. While Tiffany does own up to a lot of bad behavior in her past (sometimes very recent past), you can tell where it comes from in her personality and in her grief process, and you always know that she’s trying to move forward. I’d never go so far as to say that Tiffany is someone I want to be friends with, because that would imply a keenness to peel someone off of barstools and away from strange friends that, honestly, I’m cool without, but I do really admire her. She’s miserable and lonely and frustrated and so she does something about it. Maybe it’s the wrong thing nine times out of ten, but she does it. She keeps going. She makes mistakes and she pushes through them. So often in films like this, films where the hero is a screwed up guy who needs the help of another person (woman) to pull through, the woman doesn’t get to be her own person. She’s just there to facilitate the man’s transformation, and has no goals of her own. Not so with Tiffany. Tiffany’s issues and problems are just as real to the audience as Pat’s, and her struggles are just as important. It’s not about Tiffany saving Pat, or even about Pat saving Tiffany, it’s about two drowning people clinging to each other and finding a way to stay afloat. And that’s really great. That’s the kind of love story I want to see. It’s the kind that’s actually real. Hats off to Jennifer and Bradley then, and also to David O. Russell, for making a fabulous film. Also a shoutout to Julia Stiles for being weirdly perfect as Tiffany’s uptight older sister, and to Bobby De Niro for killing it as Pat’s dad. Win or lose, I’m really glad this movie got made. And I really love that they weren’t magically good dancers. Favorite part. My feelings are having feelings right now, okay? Why Are We So Convinced Breastfeeding is Obscene?